This is it! The best part of the host club! For those who wish to experience a real champagne call. The champagne call. Perhaps you seen it on television or pictures, but you really can't get a true feel for how spesial of an event it is without experiencing it first-hand. This tour is a special plan where you can experience that famed host club specialty-the chanpagne call-for yourself. 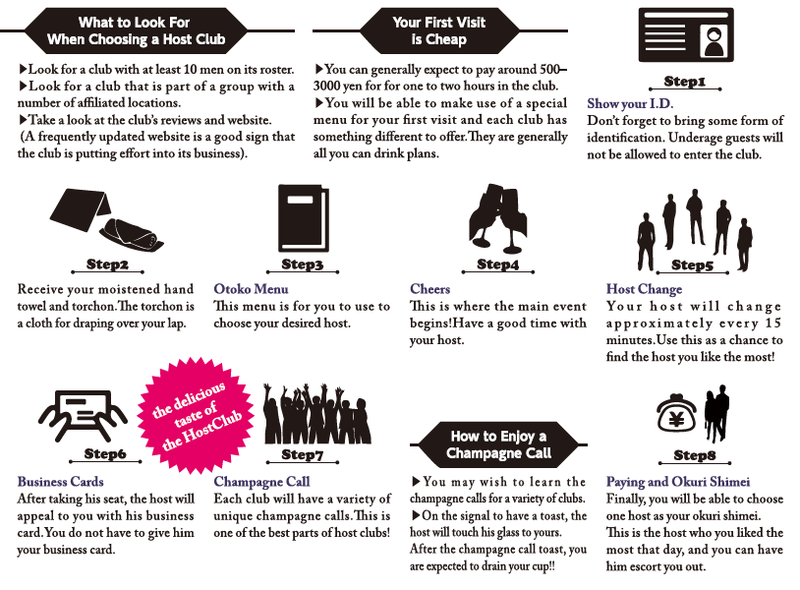 We recommend this "Champagne Call Experience Tour" for all those who would like to make their host club experience a little more exciting. The set price guarantee and pickup seavice from our highly popular "Host Club Experience Tour" are included with this tour as well, making it possible for anyone, even those who have never been to a host club before, to enjoy the tour. This plan is great for birthday celebrations for friends or even as a gift for that special mother in your life on Mother's Day. Minimum Guests: We require at least two guests for this tour. Date of Tour: The tour can be arranged for most any date. You may begin your tour anytime between 6:00 PM and 9:00 PM. one person \7,000- (Service fees and tax included). Meet up in theKabukicho area. Receive guidance to a club. meeting placebefore ending the tour. The Bachelorette Party-a woman's final chance to go out and party as a single woman before getting married. This Bacholorette Party Plan is great for guests who wish to come together with close friends and have a good time together to commemorate this special night. Minimum Guests: We require at least three guests for this tour. All you can drink shochu, wine, and soft drinks are included. Date of tour:Please confirm tour dates with us directly. You may begin your tour anytime between 5:30 PM and 8:00 PM. one person \5,000- (Service fees and tax included). the tower and the type of champagne ordered. We would be glad to scale the plan to fit your budget. (times the number of guests in the reservation). Relax and Enjoy Yourself-Even on Your First Visit! 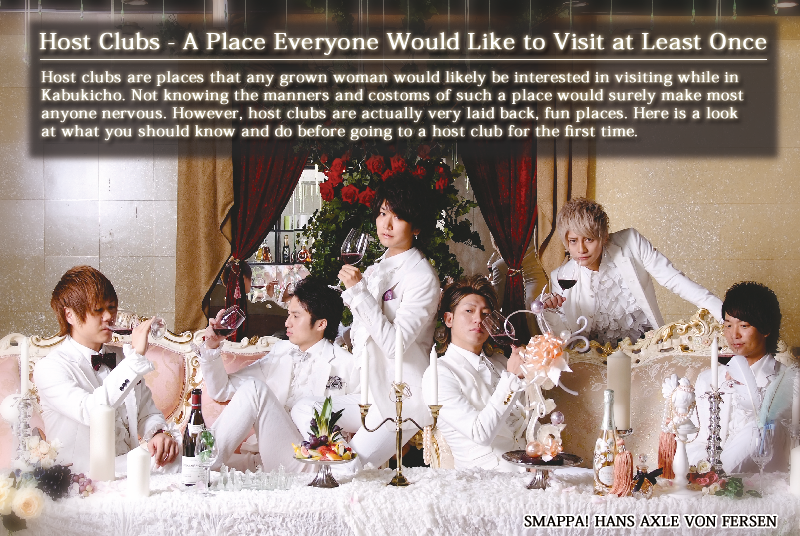 This plan will take you on a tour to two of the clubs run by the Kabukicho Host Club Smappa! Group. Each club has its own atmosphere and a different group of hosts, making this a great way to enjoy a wide variety all in one night. Once inside the club, you will be able to enjoy your time speaking with the hosts while drinking at your seat just like any other regular customer. The fee is a uniform, set price. 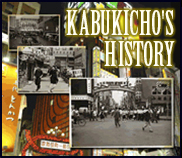 For our guests who are not familiar with Kabukicho, we provide a pickup and drop off service from the Kabukicho area as well. 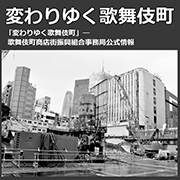 This plan is a great way to relax and enjoy Kabukicho's host clubs for single guests or guests who are sightseeing in the area. Minimum Guests: This plan is available for single guests as well as groups. a two-hour shortened tour at a price of \3,000 per guest is available. Meet up in the Kabukicho area. Guidance to the affiliated clubs. The sommeliers entertain guests with quality wines. Kabukicho's Palace of Versailles! [System Introduction]For first-time guests, 2 hours of all-you-can-drink for 3,000JPY(includes tax,fixed price). A street-level store with avast and beautiful interior! Various type of staff meet customer needs to deliver first-class hospitality. [System Introduction]For first-time guests,2,000JPY per hour. With a designation,10,000JPY for 2 hours. [System Introduction]For first-time femali guests,2,000JPY per hour. For male guests,5,000JPY per hour. All-you-can-drink sparkling wine, red wine, white wine, and tea. Please witness this [legend] of the industry. Please enjoy an elegant moment with a live piano performance. And 2,000JPY for 90minutes between 20:30-Closing. 1 bottle of shochu and all-you-can-drink mixers.